You might think that by the year 2016 some of the more backwards and bureaucratic aspects of dealing with the CA DMV would have evolved. You would be wrong. So the first week of April I got a notice in the mail (at my current address.. I updated it when I moved) from the CA DMV that my drivers license expires in June and the instructions on how to renew it online. I then thought to myself “my car registration is due in May as well, might as well do both at once!” This is a rare instance of being a proactive adult in my life and I’m rather proud of it. I hop online, renew my ID and my registration both in one transaction, and pay all the various associated fees. A few weeks later the shiny new ID card shows up, in the mail, but no sign of my registration paperwork or new sticker. After a more than a month goes by and now its the renewal date for my registration, I call in to find out just what exactly is up. I’m told there is a 2 hour hold time, and naturally opt for the “Call me back later” option. I get the call back, and after giving my info the agent on the phone, she informs me that the renewal was sent to the wrong address, not the one I just gave her “Weird” I say “I updated it at the same time I updated my ID back when I moved in February, all at once”. I’m told it apparently didn’t “take” for the registration part, and am advised to do it again online, and that once it’s in the system to call back and they will resend me my sticker and paperwork. I ask if I can just change it with her over the phone and she says the system does not allow for that. I hop off the phone and go online and do so.. but it took a few days and another phone call to the DMV get it done. When you update the car’s registered address, you have to include not only the license plate number and VIN, but also the “Effective of” date of your current registration. Since I had paid my renewal in April and we were now past my renewal date of May 20th, it was now in the system as a given day sometime in May 2016, not the 2015 on my old paperwork that I was mistakenly referencing. I didn’t think about that at first and it wasn’t until i began to randomly try various dates in a week long window around the date stamp on my email receipt for my renewal that I finally got it to accept the update submission. I then decided to wait a week or two, because lord knows government systems are probably slow to share info among themselves… and call back in today. After putting my number in the queue and getting a call back, I explain my situation to someone and ask to have the sticker resent to me. He asks for my my address again, which I give. I’m then asked for a possible previous address I may have had… oh boy.. here we go. I give my previous address, but I’m told that’s not on file either. I then offer up my address before THAT, my first one in LA and where I lived when I bought the car in 2014. He says THAT is the one on file. He then tells me I can *only* update the address by coming into a local DMV branch in person, (if you live in CA you know what THAT entails, if not, just look at the pic below!) and that I have to fill out a change of address form by hand to do so. After which, I’ll have to fill out another form for a duplicate registration copy, which requires a $50 fee. Seriously… I did everything they told me to do in the way in which they told me to do it (proactively I might add!) and now I have to pay a fee for a second copy because *they* gave me bad instructions. In 2016, I can’t believe dealing with the DMV is still this convoluted and archaic. The only relief is the fact that my registration IS up to date, I just don’t have the piece of paper to go in my car and a shiny new sticker to go with it. 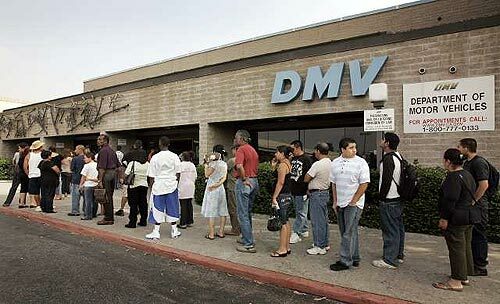 Whomever said complaining about something on twitter doesn’t fix it clearly underestimates the CA DMV! So I emailed the address in question with my email and phone number. Just now, about 15 minutes ago, and *exceptionally* nice lady called me and asked to hear my story. I ran her through the whole shebang, and she was super apologetic and asked if I would be willing to fill out the PDF of the change of address form and email it to her. Once I did, she would process it within the next business day and have the new registration in my mailbox within the next 7 business days. Wow! The CA DMV is NOT whom I expected this kind of personal touch from! The systems and processes may still be a little convoluted and janky, but at least there’s a light at the end of the tunnel!